Condo, 1 chambre + zone superposés, 2 bains, (6 personnes). Cette unité qui accepte les animaux de compagnie est une chambre avec lits superposés et canapé-lit, ce qui la rend confortable pour 6 personnes. Il dispose de 2 salles de bains et une cuisine entièrement équipée avec parasol et des chaises gratuit mis pour vous tous les jours en saison. Il ya internet haute vitesse et une laveuse et une sécheuse pour votre commodité. Ceci est un condo au dernier étage dans le bâtiment 2 qui fait face au magnifique golfe du Mexique au Maravilla. Il a une vue splendide sur le golfe et la piscine. Maravilla Resort est une communauté de plage de 33 acres à proximité de tout Destin, Floride a à offrir. Il dispose de 2 piscines (dont une chauffée), 1 bain à remous, des courts de tennis et un grand parking. Il suffit de marcher dans la rue et vous êtes les plus belles plages de sucre blanc dans le monde. Des chaises et des parasols gratuits sont fournis pendant la saison. This property is just as it appears in the photos. It was clean and bright and the bed was super comfortable with lovely, soft linens. I was surprised that the traffic did not even phase us...that had been a concern. Have absolutely no complaints...I would stay here again. Becki is the best, quick to reply, go out of her way to help and always responsive. DO be AWARE: There is NOTHING left in the kitchen, not even salt and pepper and all the cabinets are full so storing food items can be a challenge. For "sleeps 6", storage for personal items, clothes (as there is only 1 small closet), etc. is extremely minimal with most of it being in the one bedroom. Very comfortable unit with a great view. Across the street from the beach,. 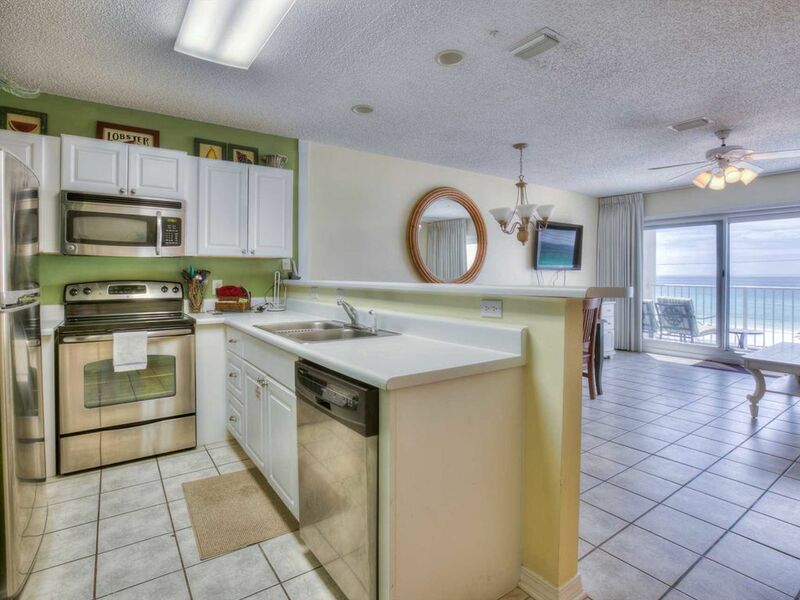 Very nice property, our unit was close to the elevator, Very close to the beach. People were friendly. My only complaint is the towels were pretty worn. We liked it enough to book another unit as this one was already booked for next year. Very clean and comfortable - awesome location! Bonus that they allow pets. Would stay here again. Great place to relax. The only thing that would make it better would be a roof over the balcony! View with a short walk to the beach!! The condo was the perfect size for two friends since it had two bathrooms. We could easily have had one more guest. It was neat and orderly - no fuss, no frills. Loved that we only had a very short walk (even tho we had to cross the road) to the beach. Also loved that we could see/hear the beach/ocean from our balcony. This was out first time in Destin and we absolutely loved our stay. This unit is right over the pool so you can see the kiddos swimming from the room and has the most amazing view of the ocean being on the 4th floor. The unit was spacious enough for the 4 of us. The amenities were all as advertised and was walking distance to several nice restaurants.